Lake Keowee is a very large reservoir in north-central South Carolina, just west of Greenville. People from all over the region come here to enjoy its first class boating on Lake Keowee. The area is sparsely populated but becoming a hot development spot for second homes. Some of the towns in the area include Seneca, Walhalla, Liberty, Six Mile, Keowee, and Clemson. 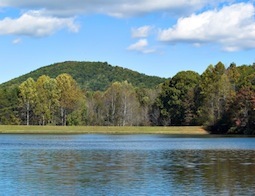 Lake Keowee is immediately south of Sumter National Forest. One of the nicest things about Lake Keowee and surrounding towns is the proximity of Clemson and Clemson University, which is just a few miles away.